Friday, August 12 at 9:30 p.m.
Monday, August 15 at 2:30 p.m.
Tuesday, August 16 at 7:15 pm. Wednesday, August 17 at 2:00 p.m. The New York International Fringe Festival (FringeNYC) celebrates its 20th anniversary from August 12 through 28 with programming by almost 200 emerging theatre troupes and dance companies. One of those troupes is OZmate, an all-female musical theatrical company based in Takarazuka, Japan, and it is the only performance group from Japan at this year’s FringeNYC. 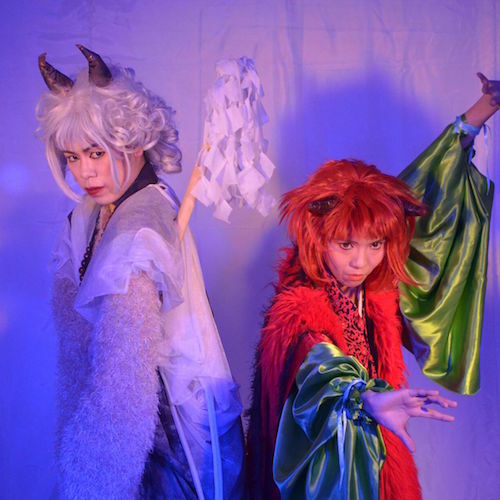 OZmate will perform its original musical The Legend of Oni, written by Naoko Tsujii and translated into English by Hiromi Zippier. The Legend of Oni takes place in the Heian period (c. 794 to 1185), before the age of samurai in Japan, when all the nobles were living and fighting to get their power. “Oni” is an ogre from Japanese Mythology and is known as the god of mountains. It is believed that the Oni, who have a fearful appearance, come to punish humans when they misbehave. The theme of this play is about the conscience in our lives. Noble Nagamichi and his son, Ebuki, are in the middle of a power struggle. Nagamichi looks like a human but has the heart of an Oni. Ebuki changed his appearance to an Oni to act out on the hatred and grudges he held against his father. The overarching message is that each of us has a seed of becoming an Oni – hatred, anger, and grudges – in each of us. The show had successful runs in Tokyo and Osaka in 2013. The revised production for FringeNYC has 21 freshly composed original songs with traditional Japanese drums. The all-female cast will perform in gorgeous Kimono-based costumes with powerful Japanese fan choreography. For more information and to purchase tickets, please visit FringeNYC’s website.